You’ll have to excuse my absence. For the few of you who may have been paying attention anyway. I don’t pretend that anyone might be missing my jibber jabber. But I have sure missed writing it. Unfortunately the last few months have been a blur and I just haven’t had any time to write. In April, my dad had an aneurism on his heart which caused his aorta to tear. In layman’s terms, we almost lost him. He was rushed into emergency open heart surgery. My mother and I were both at the hospital with him fortunately, but once we got the news, we had a whirlwind 15 minutes to take in the news, discuss insurance and say our goodbyes as there was only a 20% chance of survival for this particular surgery. I’ll get the whole story out later, but that’s the gist of it. The weeks to follow were really difficult for everyone. Him especially obviously. Luckily, he’s recovered at a much faster rate than expected, but he’s now looking at another one to two surgeries, most likely with another open heart. The doctors could not fix all of his issues the first time because the survival rate was already so low. They just had to fix the immediate issue and get out. Shortly thereafter we discovered that my uncle has cancer. He recently had a procedure to try to shrink his tumors. Unfortunately 10-12 still remain. I don’t think I need to discuss what happens next. Then my cousin lost an arm and a leg in an IED explosion in Afghanistan. With the info constantly changing and the family not being sure what was actually going on, the event was made even more dramatic. But he made it to Germany and then eventually back to Walter Reed in the states. He’s an amazing kid, a hero and is in great spirits. When my aunt got to the hospital he looked at her and said “mom, I have to tell you, I’ve had a hell of a day!” And he laughed. He has a long road ahead of him, but after a few more surgeries he should be in a wheelchair and mobile. His upbeat attitude has kept the family going. President Obama went to visit him personally today and I’m patiently (not really, I’m never patient) waiting for the pictures! Pretty cool. There were some other things mixed in here as well. Some friend drama which resulted in losing a few friends. Some good happenings that resulted in making a few new friends. I also threw four back to back events during all of this, which was completely exhausting, but I got a promotion in the aftermath. And finally, last week I went on a fabulous, much-needed vacation to California. We left Ava with my in-laws so we could just truly relax, which in theory sounded like a good idea. But with everything else, it was actually much too much for me. I missed my baby. It took two full days to really let go. But after that I really did have a great time. We swam, we sunned, we hiked, we shopped. Really can’t go wrong with that. And because I think I’ve earned it, I’m taking another week off to spend with Ava at the end of July. Much pool time will be had. Maybe the beach if the wind carries us that way. So, I’m back. Making my way back anyway. With lots to share. What I’m Loving This Week. This guy. I have watched this everyday for the last three days. People keep posting it and I keep watching. Don’t try this at home kids. I was sick earlier this week and glued to my couch all day on Tuesday. I pretty much spent the entire day watching television because I couldn’t focus on anything else. I sat and watched all of the past few weeks of SNL. Yes, I realize that they aren’t that funny. But it was that kind of day. So I got to last week’s episode with Jonah Hill and The Shins. And I just want to know whether it would kill The Shins to ever, just not sound like the Shins. Sure, the entire band has been replaced and they’ve said they are going in a new direction, but I just don’t see it. Still sounds like The Shins to me, except that they seemed to have switched from the acoustic to electric, which doesn’t do them any favors. Beyond that, the only real difference I hear are the lyrics, which are just more cliché. Snooze. I’m not trying to hate on them. I’ve always liked them. Never loved them, but liked them. I just don’t get behind all of the hype they’ve always received. I haven’t listened to the new album yet and I will gladly take commentary from anyone that has and thinks its amazing. Good song, but I’m still sitting in this dingy doctor’s office with a crazy person. Happy Sunday everyone. It’s been a long weekend. Which followed a long week. Sigh. I need a long vacation. But with three major events coming up and my new side project, this is definitely not in the cards for me. So my pins today are mostly just things that I want. And might buy. Because I can make almost any purchase seem reasonable. It’s a skill really. Want, want, want. 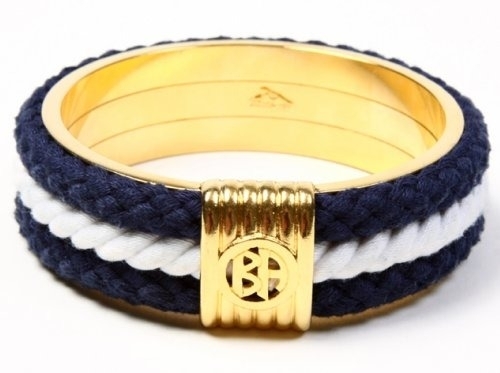 This is from Nautical Luxuries. Even the name makes me happy. A steal for $170! Right? Uh, right? Ava needs this in her life. 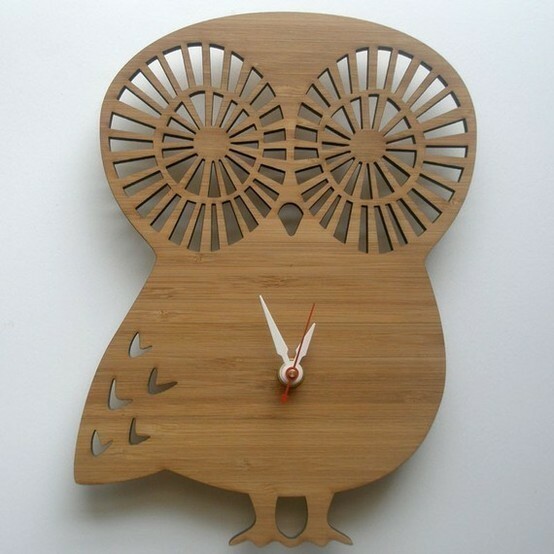 My husband has tried to enforce an owl ban in the house, because I’ve gone a bit overboard (so he says,) but this is so precious I’m sure he will forget. Here’s the thing. Steve Madden hates women. No, he hasn’t said that anywhere, but I swear its true. Either the shoes fall apart or they are incredibly uncomfortable. But you can’t deny the fact that the guy makes a cute shoe. I love these. My closet is starting to look like a Navy uniform, so what’s a little more? My favorite boots are Steve Madden. I’ve had to take them in to be resoled once already and it cost almost as much as the boots themselves, but they are my favorite and I will not hesitate to do it again. Curse you Steve Madden. Get in my life. I name you Grey Wind. That’s right. I name all of my purses. We have a special relationship. I had to put Hamptons out to pasture this season so I’m in need of a new summer go-to bag. The husband took the child to his folks so I could have a few hours to myself this afternoon. 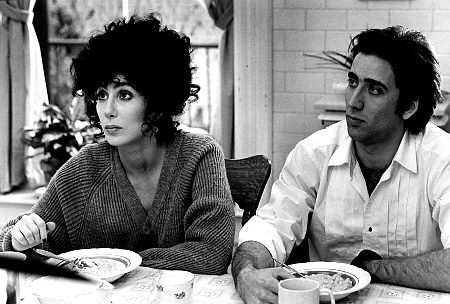 I’m popping in Moonstruck in about five seconds. It’s that kind of day. Bella Luna. Last weekend I wrote a blog and have since taken it down because someone I know took it as a personal attack. It had zero to do with him whatsoever but I took it down anyway. In retrospect I wish I had left it up because it wasn’t an attack on anyone. Even my husband said he was disappointed in my decision to remove it. This is my space for my thoughts and feelings. If I have to keep them guarded here then what’s the point? I’m not a mean-spirited person and I do not ever go out of my way to attack anyone. Unless of course you are Lindsay Lohan because I can’t seem to lay off that one. Sorry Linds. 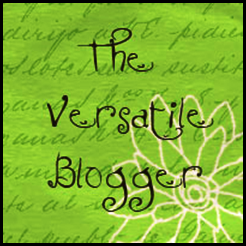 So if you find yourself offended by any of my comments please just close the tab, because this is my blog. The internet is a big place. Read something else. This is a few weeks behind, but I thought I’d share anyway. I went to see The Black Keys and Arctic Monkeys concert at the Verizon Center a few weeks ago and I have to say it was pretty awesome. Even though I’m not into the Arctic Monkeys. I was for about five minutes when they came out in 2006 but they quickly made one of those stupid being better than the Beatles comments and I was over them immediately. They were just riding in on The Strokes wave anyway and The Strokes are a much better band. Don’t get me wrong, I’m certainly not opposed to an arrogant rockstar. Even those that make comments about being better than The Beatles. Those Gallagher brothers and their ridiculous sibling disputes in the Oasis days (and beyond) entertained me more than I’d like to admit. Those two were oozing with arrogance. But the Arctic Monkeys were never good enough for that level of arrogance. And I haven’t paid any attention to them since. Until now of course. But they put on a decent show. Not amazing by any means, but pretty decent. I got the tickets through work and we sat in a box. I’m generally pretty happy down on the floor, but I would never turn down a box seat. We had our own bathroom, free food and drinks and a great view. The only downside was that there were some industry people in the box with us, so we couldn’t really rock out as hard as we would’ve liked. But free food and drinks can make any concert a little better, so the Arctic Monkeys were more than satisfactory. The Black Keys were awesome though. I wasn’t sure if their type of sound would be able to fill up an arena like the Verizon Center, but their sound techs apparently know what they are doing. The Black Keys proved that two guys with just a guitar and a drum set are more than enough to fill an arena. I think The Black Keys are really one of the best rock bands out there right now. They’ve kind of filled the Kings of Leon void for me. I played them to death and then they blew up and became uber popular on the radio and everywhere else and I found myself needing a break from them. I’ve always liked the Black Keys, but they really stepped up for me when I went on the KoL break. 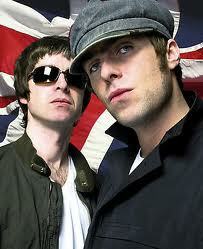 Hi, we're the Gallagher brothers. We're so arrogant that we're stealing the thunder from this blog post. I’ve been thinking about Easter quite a bit this week. There’s a lot I want to make this year. But it all depends on where we are going. With two families and one two-year old, holidays can be tricky. We often have to celebrate two weeks in a row. My husband has two siblings that live in Texas and I’m the first-born so everyone wants to have Ava. And then we often end up at my aunt’s house if we’re doing my side of the family and she’s a Martha Stewart type so I sometimes don’t bother doing anything if that’s the case. But here are my inspirational Easter pins. I won’t lie to you. I make an awesome deviled egg. They get devoured every time. 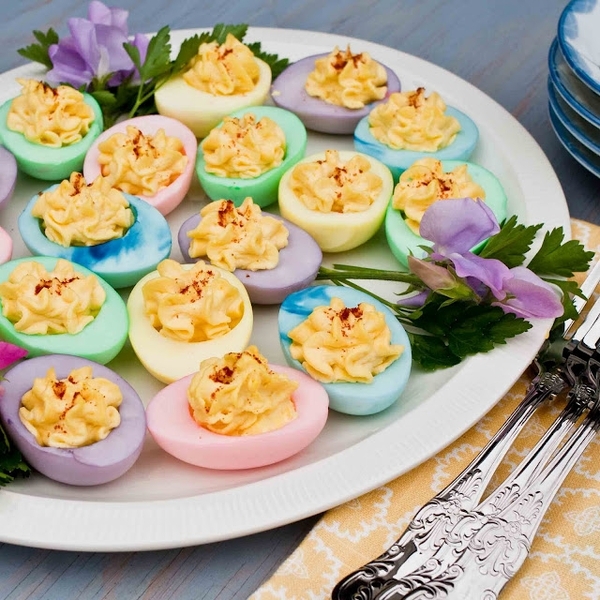 But I hadn’t thought about using dyed eggs before. I can’t understand why. It seems like a no-brainer. So at the very least I’ll be making these. I have a great egg platter that I am in love with. 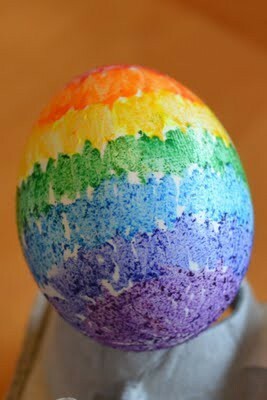 This was done with crayons on still hot boiled eggs. How easy is that? And they look really cute. Here’s the tutorial that came linked with the egg: http://www.cometogetherkids.com/2011/04/melted-crayon-easter-eggs.html I did something similar at Halloween and melted crayons over pumpkins. It was time-consuming, but the end result was pretty cool. I gave up sweets for lent this year, so I will definitely be partaking in something delicious on Easter. I’m actually going to try to stay off the sweets after that because it was embarrassing difficult to do. But I am definitely having Easter cake. 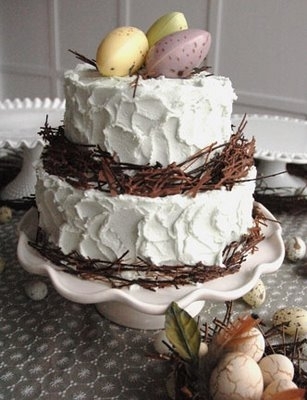 The “nest” on this cake is actually made from chocolate shavings. 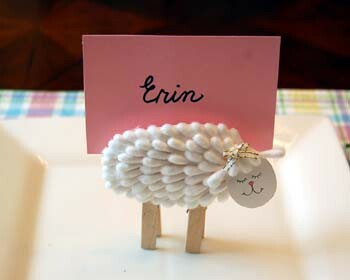 The might be the cutest placeholder ever. There is no tutorial linked with this, but it looks fairly simple. Clothespins, q-tips and construction paper. Voila. 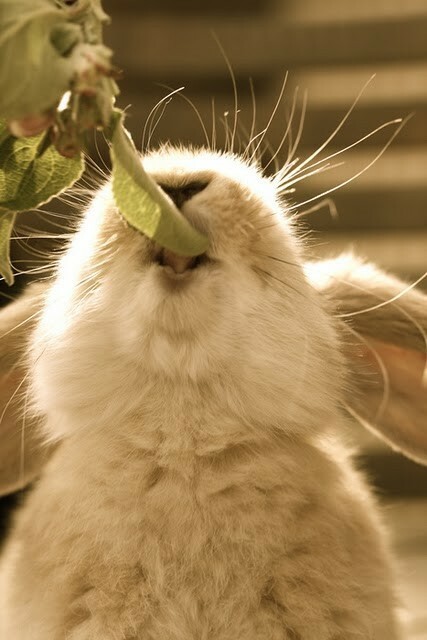 And if someone do me a solid and bring me this bunny immediately, I would really appreciate it. Really. A day late and a dollar short it seems. But last week was so nuts. Ava was really sick and I kept her home for a few days only to come back to work to further bathroom offenses. Friday night I went to the Black Keys/Arctic Monkeys concert with some people from work (more on that later,) spent Saturday with my family, went to the St. Patrick’s Day parade with the in-laws and a two year-old who still isn’t 100% well on Sunday, and now I can toss in Daylight Savings so I’m pretty much done over here. I won’t pretend that I’m not looking a little worse for wear this morning. One of the other mothers at daycare (who I’m already not terribly fond of) said to me “oh, are you on vacation today?” The only thing I could respond with was “no, this is just what I look like today.” So, here are my pins from last week a bit late. Playing catch-up over here. 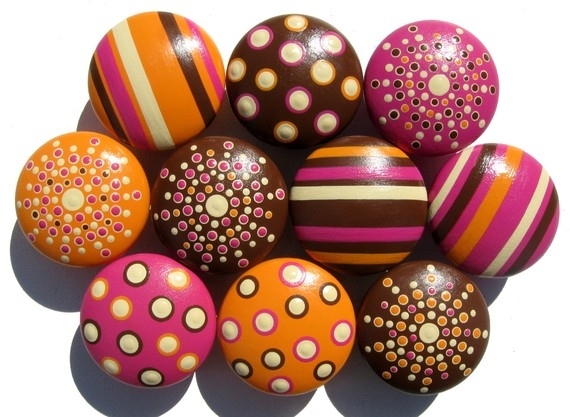 I love these colorful knobs. They would look really cute on a kid’s white dresser. The pin led me to her Etsy shop Sweet Mix Creations. I love the light switch plate cover. There was no link with this one, but its pretty easy to do. 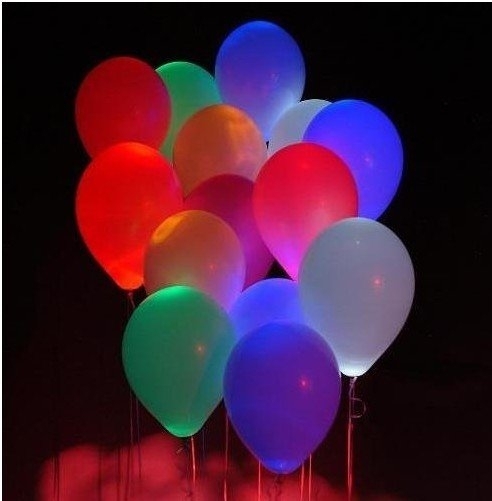 Put a glow stick in the balloons before blowing them up. These would be awesome for night parties. 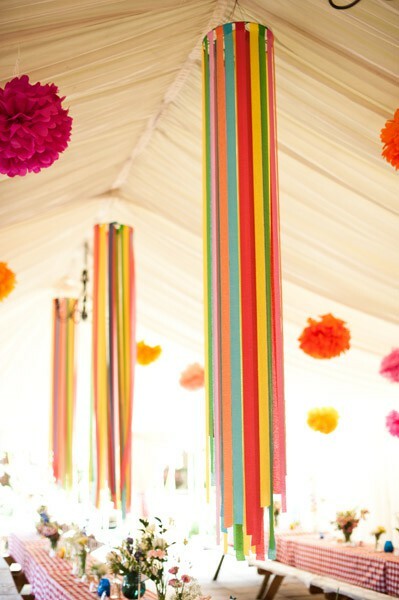 Speaking of parties, how cute are these tissue chandeliers? I really want to make these. Is it too early in the season to plan a bbq? 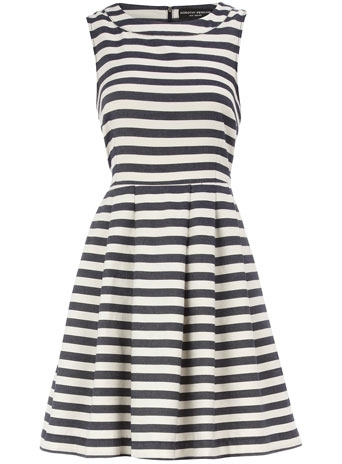 This dress has my name all over it. Want. 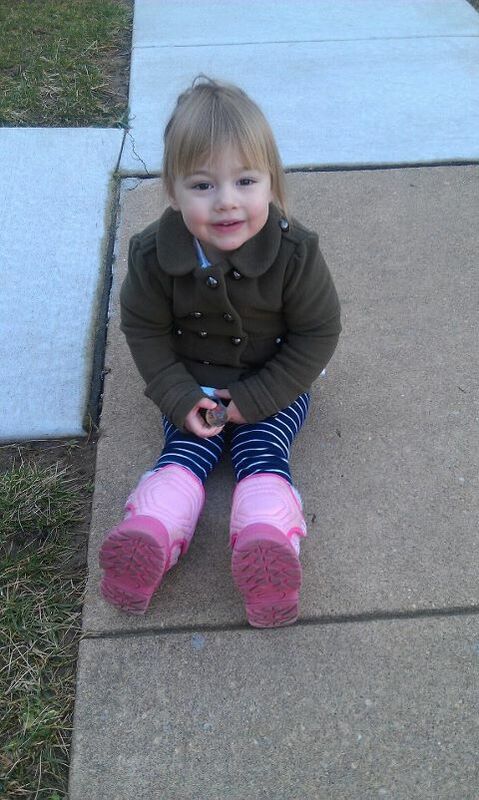 But the best part of last week was my mini-me feeling better! I have a bathroom problem. But no, it isn’t what you think. I think I may be overly observant, but I am constantly offended by the public bathroom down the hall from my office. It all started with the “4′ o’clocker.” I could go into details here, but I won’t. It’s too much. Let’s just say I avoided the bathroom at 4:00 everyday for a few months. But that person no longer works in the building so it’s safe again. Last month they installed this littler spritzer in the corner that shoots off this strong, floral scent that overwhelms the entire bathroom. It’s on a timer and I haven’t quite figured out how to avoid it yet. But I hate it. It makes my nose wrinkle up. There are a series of offenses I could list, but alas, Festivus has come and gone, so I will save the airing of the grievances for next year. This is also a last-ditch effort to keep from sounding completely OCD. Except for this. Yesterday I was washing my hands at the sink and a woman comes out of the stall and does a quick swoosh under the water. No soap, so scrubbing, just a quick swoop under the water. Then she pulls out like 40 paper towels! First of all, that’s wasteful. Secondly, what do you need paper towels for? You were under the water for maybe five seconds. So then I started thinking, ok, maybe she isn’t a hand washer? Let’s go ahead and just put that aside for a minute and pretend that it isn’t disgusting. And that everyone else on that floor doesn’t have to touch the same door knob that she is leaving her germs all over. Let me ask you this – If you weren’t a hand washer, but were next to someone washing their hands at the sink, wouldn’t you wash anyway for appearances sake? And then I thought, Dear God, that was her version of keeping up appearances. So once again I was offended by something in that bathroom. Next time I think I should ask for a raise I’m going to raise the topic of a private bathroom instead. I really don’t want to tell you guys how much time I sat thinking about this yesterday. Let’s just say it was a lot. As I mentioned previously (Swap It To Me,) I’ve started using swap.com. I did not anticipate getting so into it. Although I never really do. And now I’ve got one more online distraction to add to ever-growing list. I’ve already made four swaps and I’m pretty pleased with the results. But today something strange happened. I got two packages and I was only expecting one. I have no idea who this person is that sent me the other package, but it contained an old beat up copy of “The Dreamer’s Dictionary.” ‘From A to Z, 3000 Magical Mirrors to Reveal the Meaning of Your Dreams.’ I definitely did not swap anyone for this. It’s just not something I’d ever pick up to read. No offense to anyone that might, I don’t have anything against it. It’s just not something that would pique my interest. And it was printed in 1975. Unless I’m in a used book store, I am not going to go out of my way for anything this old. So me being me, I daydreamed this entire wacky scenario in which I have been sent this book with some sort of evil spirit in it that will now be haunting my dreams. My imagination has never quite aged with the rest of me. It still tends to run quite wild at times. But seriously, why in the world did this guy send me this book? I don’t even know where Evans Mills, NY is. Pretty sure this means Freddy Kruegar is after me. So if you guys don’t hear from me, call a detective, would you? This was all meant to be sort of funny, but I’m pretty sure I’ve just come off as a crazy person. Eh. I’m okay with that.